Sinusitis feels like a cold that never goes away. It often hurts - sometimes a lot. It reduces your energy level, causes mental fog, interferes with sleep, dulls your senses of smell and taste, makes you hoarse, and gives you bad breath. Modern-day pollution has increased the number of people suffering from allergies. As a result, sinusitis is also on the rise. 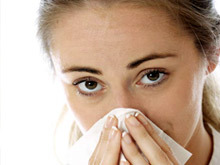 Sinusitis is an inflammation or swelling of the tissue lining the sinuses. Normally, sinuses are filled with air, but when sinuses become blocked and filled with fluid, germs (bacteria, viruses, and fungi) can grow and cause an infection. Primary symptoms, which tell your doctor that you have acute sinusitis, include facial pain/pressure, nasal stuffiness and thick (green or yellow) discharge, loss of smell, cough/congestion. These could be accompanied by additional symptoms like fever, bad breath, fatigue and dental pain. In children, allergies, smoke or even bottle drinking while lying on the back contribute to sinusitis, while in adults, it is mostly smoking, and infections that trigger the illness. Washing or fluffing your pillow regularly. Washing throw rugs every six weeks. Avoiding wall to wall carpeting. Staying away from perfumes or things with odor. Avoid air pollutants (such as smoke) that irritate the nose. Improve household ventilation by opening windows whenever possible. Use a humidifier in the home or office when the person has a cold. Sleep with the head of the bed elevated. This promotes sinus drainage. Minimise exposure to persons with known infections. Avoid contact with people who have colds and other viral upper respiratory infections. Avoid temperature extremes - Very high and low, or sudden changes in temperature, will cause sinus pain. Reduce stress. Psychoneurobiology tells us that white cells that defend the body actually become weaker when one is depressed or under great stress. Avoid swimming, or use nose plugs when swimming or diving in a pool, to keep chlorine from irritating the sinuses. Washing of your nose with saline has definite benefits, as is verified by medical research. Good hygiene helps. Bacterial and viral infections are the most common causes of sinusitis, therefore the risk of getting them needs to be reduced by carefully monitoring your hygiene, and frequently washing hands with soap and water. Drink 8 to 12 glasses of water daily. Have hot tea as soon as you get out of bed. Hot liquids help the mucus to flow, relieving congestion and sinus pressure. It will reduce the morning symptoms. Hum your way to health. An hour a day of concentrated humming could dilate sinus blood vessels enough to help.